PRO: Signed with the Riders in October, 2018…signed with the Jacksonville Jaguars in December, 2017…signed with the Cleveland Browns in June, 2017…claimed by the Indianapolis Colts in November, 2016…signed with the San Diego Chargers in October, 2016…signed by the Dallas Cowboys as an undrafted free agent in May, 2016. 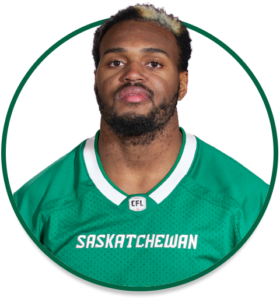 2018: Signed with the Riders practice roster in October. Played 15 career regular-season NFL games from 2016-17. COLLEGE: Played four seasons at Norfolk State (2012-15)…played 46 career collegiate games…registered 372 defensive tackles, 52.5 tackles for loss, 22 quarterback sacks and three interception…named 2015 FCS Top Defensive Player.